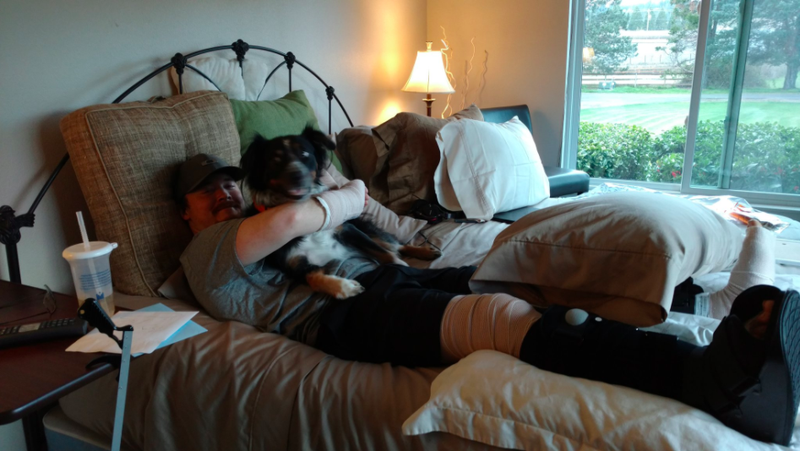 Alex Lovell Recovering with his dog. Police arrested a Washington state woman earlier this month after she stabbed her boyfriend with a Japanese-style sword purchased at the mall. She told the police that she stabbed him because she believed that he was cheating on her, and also because he played too much PlayerUnknown’s Battlegrounds. Barber Emily Javier, 30, had been living with her boyfriend, aspiring professional PlayerUnknown’s Battlegrounds player and part-time bookkeeper Alex Lovell, for the two years leading up to the incident. Lovell, 29, is currently recovering from his injuries at home. “I wasn’t a sweaty nerd, more of an Ethlete,” Lovell said in an interview with The Oregonian. He told the paper that he plays PUBG for 12 hours a day. According to the affidavit, Javier said she was frustrated that Lovell was paying less and less attention to her as he got deeper into PUBG, but what took her over the edge was finding Tinder on his phone, and later noticing some red hairs in the shower drain (Lovell’s hair is colored green). Speaking to Kotaku from his bed at home, Lovell said that while he is not participating in any more interviews prior to Javier’s trial, he disputes Javier’s statement that Tinder was installed on his phone. He also disagrees that his PUBG playing was a motive for Javier’s actions that night. Javier’s lawyer told Kotaku that her family described the incident as “out of character.” Javier has no criminal history, he said. “There’s a whole lot of other layers to this that we just haven’t gotten to yet,” he said, but added that he could not elaborate further. Javier, who pled not guilty to first-degree attempted murder, is currently in jail awaiting trial; her bail is set to $350,000. Javier stated to the police that in late February she went to the the mall and purchased a “samurai sword” to stab her boyfriend. “I thought I was gonna stab him while he was sleeping,” the affidavit quotes her as saying. After a week of mulling it over, Javier decided to go through with it after Lovell allegedly came home one night and simply ignored her. On her side of the bed, Javier hid the katana, along with two knives she’d taped together. She also hid Lovell’s phone. In the middle of the night, according to the affidavit, Javier took out the weapons, illuminated her boyfriend’s body with her smartphone, and stabbed him with the sword. Lovell sprung awake and fought her off. His fingers were cut off almost at the base, he told The Columbian, and his limbs are lacerated. He won’t be able to walk for several more weeks.